Astros pitcher Kalev Betancourt strikes out Dominic Bejerano of the Braves during Game Three of their Pacific Division Championship Series. The Astros beat the Braves 11-0 at Gilroy to win their first Pacific Division Championship and fourth championship overall (three American Division Championships as the Cardinals). (Photo submitted by Jon Trees). (Front row) Matt Bayne, Phil Young, Michael Hernandez, Kalev Betancourt, Justin Mead, Ronnie Marino, Jon Trees (Back row) Miguel White, Matt Orvick, Steve Arsenault, Jon Norris, Greg Hancock, Robert Apodaca, George Fox, Dave Norris, Riall Moore (Not Pictured) Eddie Padilla, Daniel Barone, Vinnie Perez, Lou Strickland (Photo submitted by Jon Trees). A funny thing happened on the way to one of the managers meetings this spring. I got a call from our catcher, Phil Young, asking how hard would it be for the Cardinals to convince the league to allow us to change names and become the Astros. THAT?S RIGHT, THE ASTROS! That?s barely one step above the DODGERS! But me being the sensitive, caring type — it's been Phil?s fantasy to be an Astro all his life — thought we could accommodate his request and quite frankly we needed to change something. Heck, we lost in the championships two years straight and hadn?t won a championship since three-peating the American Division in 2004, 2005, and 2006, so I figured "What the hell. I can live with being an Astro for a year." Turns out Phil had already purchased jerseys from the "Real" Houston Astros! Yep, game-worn jerseys from spring training. Don?t know how he got them to give them up. He probably did a background check and dug up some dirt on somebody. So that is how the Cardinals became the Astros. The Astros/Cardinals had the usual guys come back from the 2009 campaign. All-star pitcher Jon Norris worked out all winter with big brother, Dave Norris. Miguel White and Riall Moore worked out with them, too. Phil Young, Matt Bayne, Ronnie Marino, Steve Arsenault, Greg Hancock, Rob Apodaca (yes, his dad is the pitching coach for the Colorado Rockies), Lou Strickland, and Eddie Padilla were all ready to do battle again in the Pacific division. 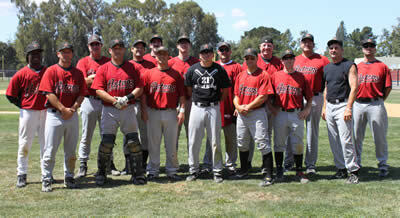 We added big hitters Matt "The Bat" Orvick and George Fox. Braves shortstop Dominic Bejarano tags out Astros Riall Moore during a run down in the Astros 11-0 win to take the Pacific Division Championship Series. (Photo submitted by Paul Woo). Behind the scenes our VP of player personnel, Eddie Padilla, was in negotiations to sign top prospects Daniel Barone, Kalev Betancourt, Michael Hernandez, and Justin Mead. Daniel and Kalev are co-owners of Barone?s Baseball in Hollister and will continue to be the Astros pipeline for young talent going forward. Going into the season, the Astros pitching staff of Barone, Norris and Betancourt was arguably the best rotation in the league. However, after a few games Barone went down with a serious injury that put him on the DL for the rest of the season. The burden shifted to Norris and Betancourt to carry the load. Both were up to the task. Astros pitchers allowed only 57 runs (or 3.5 runs per game) in divisional games all year! ERA for divisional games was significantly lower. Pitching wasn?t the only highlight of the year for the Astros, the offense was just as potent, scoring 147 runs in 16 divisional games (9.1 runs per game). Home run leaders were Michael Hernandez and Matt Orvick, both with four bombs each. Our batting leader was Michael Hernandez with an average well above .500 (stat keeper on vacation so incomplete). Biggest hit of the year was Eddie Padilla?s walk off grand slam in the playoffs against the Padres. Astro all-stars for 2010 were third baseman Greg Hancock (six years in a row ? ), pitcher Jon Norris (three years in a row?) 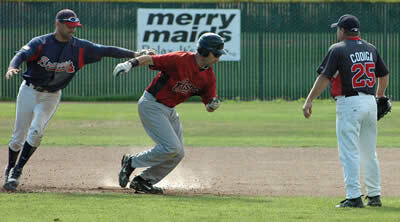 and shortstop, second baseman Michael Hernandez. Many Astros deserved to go but only two position players and one pitcher could be sent. 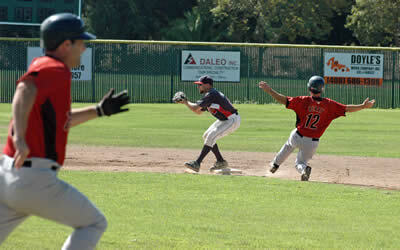 Braves second baseman David Painter takes the feed from shortstop Dominic Bejarano during Game Three of the Pacific Division Championship. (Photo submitted by Paul Woo). Bigger then any of the on field performances this year, was that the Astros were a team. Everyone contributed and everyone understood what it took to win a championship. Everyone sacrificed and we all had a common goal. We all worked hard to get there and the team chemistry was amazing. The Astros look forward to next season and hope to compete in the National Division in 2011.